While celebrating the 30th anniversary of the Arnold Classic in Columbus, Ohio, we had the opportunity to speak with Ah-nold himself! During an exclusive interview with Schwarzenegger, he spoke with great passion about his bodybuilding and fitness expo, which has actually gone global and is now celebrated on every continent. But it all started here, in Ohio, three decades ago. Crom, a "Conan the Barbarian" series and a new western called “Outrider” is now being developed over at Amazon! Outrider, an event series with Schwarzenegger attached to star and executive produce, is a mystery set in the Oklahoma Indian Territory in the late 1800s. Killing Gunther is Now on Blu-ray! Win One From Us! Killing Gunther is NOW on DVD / Blu-Ray! See Schwarzenegger terminate Taran Killam! Special features include a Blooper Reel and 2 deleted scenes. Even better, we have 4 Blu-rays to give away! Enter now. We will pick 4 winners at random. Happy New Year: 2018’s Blockbusters to Erase 2017’s Lackluster Year! It’s Turbo Time for Arnold Christmas Cheer! Merry Christmas, Arnold fans! It’s our favorite time of year when we get to see Schwarzenegger give back so much to the people with toy donations to the Hollenbeck Youth Center and support the children of After-School All-Stars! Tell us how you gave back this holiday season. The Terminator Endo Speaker by AC Worldwide Will Be Back! We're delighted to hear AC Worldwide is moving forward with their Terminator Endoskull speaker with so many great functions! 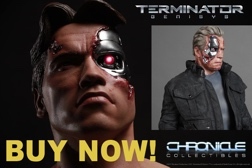 This fantastic project is ready to get going in 2018 so AC Worldwide is now taking pre-order commitments for the Terminator T-800 speaker. Schwarzenegger Wins the BAMBI Award! Hot off the heels of winning GQ’s Legend of the Century award, Arnold Schwarzenegger has now won a Bambi! All New Predator 30th Anniversary Jungle Demon 1:4 Scale Figure! The hunt is on for the all new 20' inch tall Jungle Demon Predator figure! This massive, limited edition action figure marks the 30th anniversary of the original Predator movie! The stealthy Predator 30th Anniversary Jungle Demon 1:4 Scale Action Figure is cast in clear plastic with camouflage accents to capture his cloaked appearance in the jungle. The Legend of the Century Award Goes to Schwarzenegger! On Thursday, November 9th, Arnold Schwarzenegger was invited to the GQ Men of The Year Awards at Komiche Oper in Berlin, Germany to receive the Legend of The Century Award. Some people can be great, some inspirational and some can become legends.